Fall has officially arrived here in Florida today. Waking up to a very brisk, chilly morning was refreshing but also a bit of a shock to the system I must admit. It is rather ironic that as I sit here freezing in Florida while family in Queens, New York will most likely be hit by a Hurricane in the coming hours. 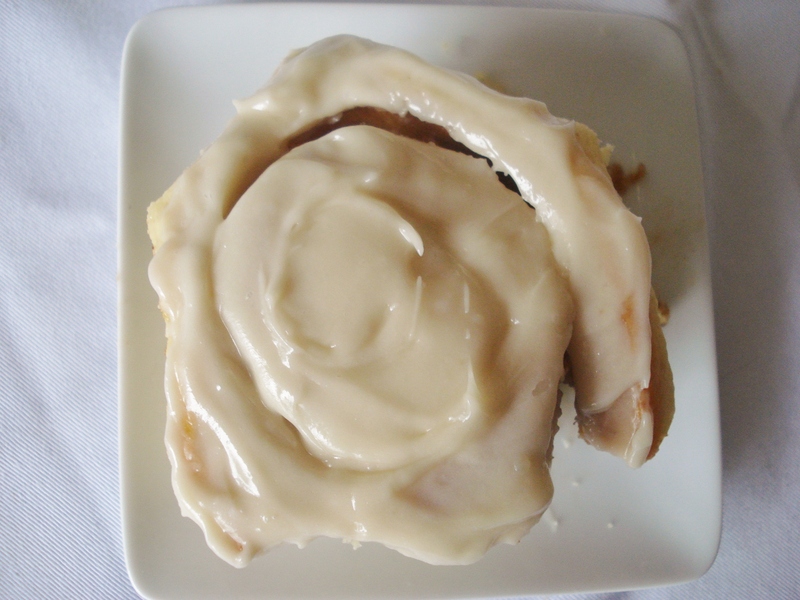 With that said, I guess it is only fitting that there is no better way to warm up your day then starting it off with a sweet and gooey, calorie-laced cinnamon roll straight from the oven. Although there are many food court or fast food leaner and punier cousins to the homemade cinnamon roll, nothing is quite as satisfying as eating a cinnamon roll made from scratch or a neighborhood bakery. 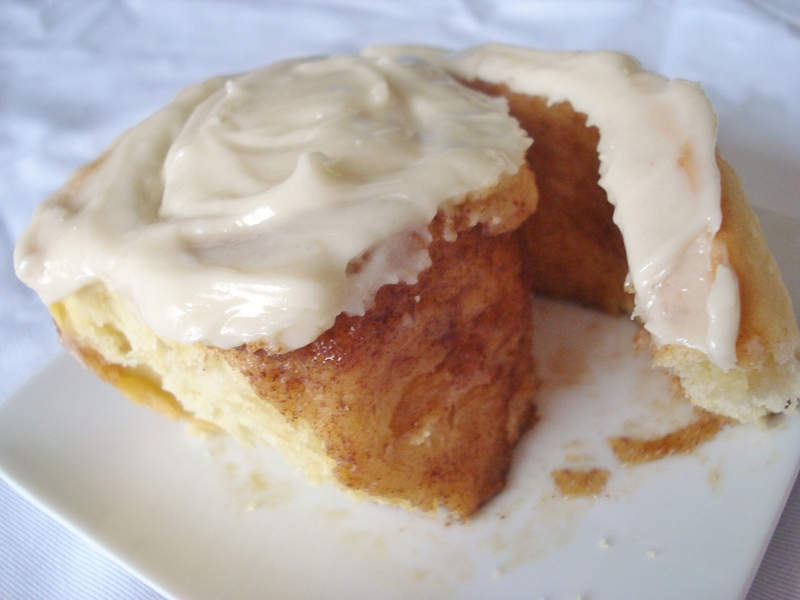 Processed cinnamon rolls lack the richness of soft, buttery Brioche dough, the gooey abundance of cinnamon-sugar filling, and the thick and sticky cream cheese glaze that a great homemade cinnamon roll can offer. To start the cinnamon roll off on the right foot, selecting the proper type of yeast dough is key. Some cinnamon roll formulas will use a sweet bread dough which is too lean, a Danish dough which is overly buttery and way too much labor, or Challah which is neither rich or soft enough for the ideal roll. By far the best in my opinion is Brioche, which isn’t flaky or overly buttery, but rather a tender and rich base with which to begin the Ultimate Cinnamon Roll. Next stop is the filling. Granulated sugar is far too bland in a cinnamon roll of epic status. Using light brown sugar instead adds a caramel flavor which is further emphasized when it melts down into ooey gooey deliciousness. Just be sure that you use light brown sugar and not dark because then you will go from one extreme to another. First being too bland and then to being too bold and overshadowing the cinnamon with caramel flavor. Any cinnamon of course would do in this formula but I wanted the Ultimate most Epic Cinnamon Roll and to do that you need some fine cinnamon. I chose to use a blend of hand-mixed China, Vietnamese, Korintje, and Ceylon Cinnamon. The result… filling that is PERFECTO!!! Of course with more filling comes the risk of it all crumbling out everywhere as it is rolled up. To prevent this, a slathering of butter is necessary and since the original yeast dough base is not a significantly buttery dough to begin with, slathering the butter in this step doesn’t affect the dough in a negative way but rather enriches it perfectly and provides the desired rich, gooey filling. Last stop on the road to Ultimate Cinnamon Rolls ends with the glaze. Most formulas top the rolls with a cream cheese frosting full of butter and confectioner’s sugar, causing already rich rolls to be just too darn sweet. By eliminating the butter and replacing it with a bit of milk and vanilla, the cream cheese glaze now had the perfect amount of rich flavor without being too over the top. By adding a bit of the glaze while the rolls were still warm allowed the it to penetrate the rolls and add an extra element of flavor and tenderness. Adding the rest of the glaze after the rolls had cooled for some time prevented it from melting and created a nice thick layer of frosting sure to never disappoint. Adjust oven rack to the middle position and heat to 200°. Once preheated, shut off the oven. Line a 13 x 9 in. pan with foil, allowing a bit of excess to hang over the edges. Grease the pan with cooking spray. Combine brown sugar, cinnamon, and salt in a small bowl. Turn the risen dough out onto a lightly floured counter. Roll the dough into an 18 in. square. Spread the softened butter over the dough, leaving a ½ in. border around the edges. Sprinkle with the cinnamon-sugar mixture and lightly press the sugar mixture to adhere it to the dough. Starting with the edge nearest you, roll the dough into a tight cylinder. Pinch the seam lightly to seal it and place the seam side down. 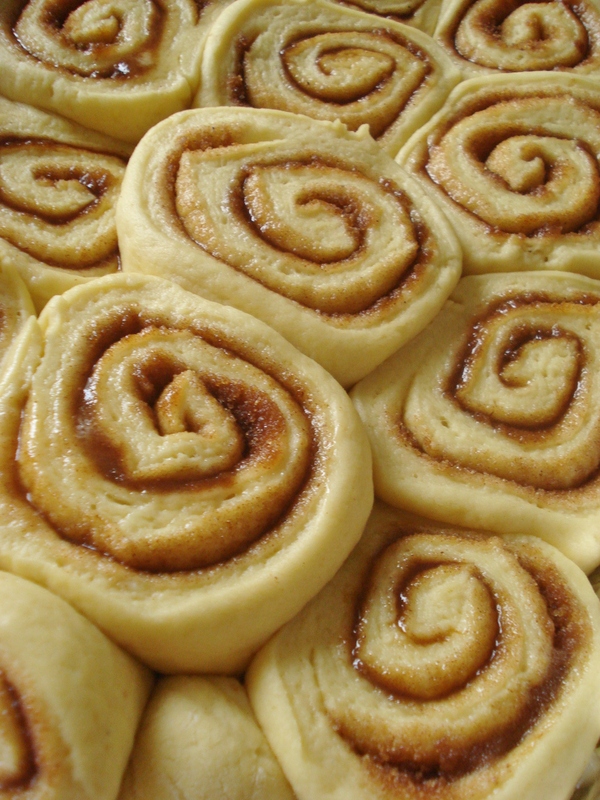 Use a metal bench scraper or knife to cut the rolled log in half and then into 8 pieces for large cinnamon rolls or 12 pieces for mini cinnamon rolls. Transfer the pieces, cut side facing up, into the prepared 13 x 9 pan. Cover with plastic wrap and proof in the warmed, shut off oven until doubled in size, about 1 hour. Remove cinnamon rolls from oven or warm spot. Discard plastic wrap. Heat oven to 350°. 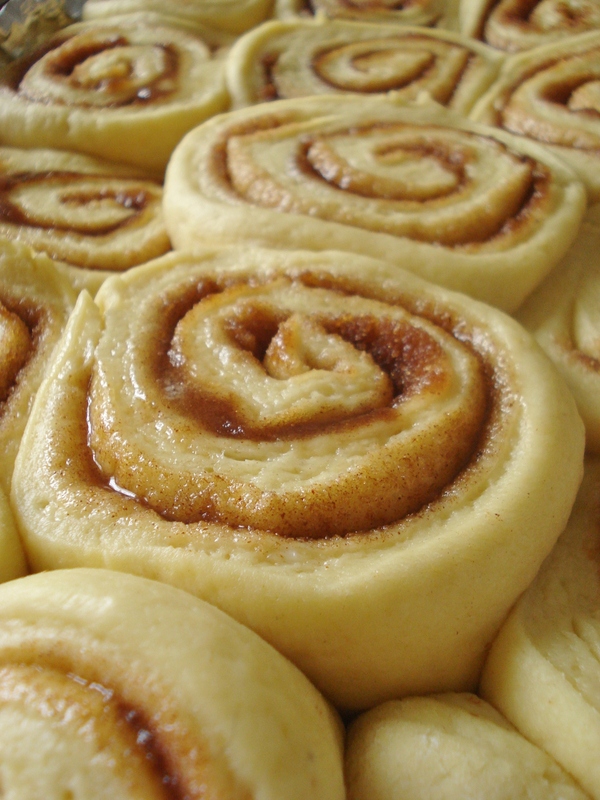 Bake cinnamon rolls until golden brown and filling is melted, 30 to 40 minutes. 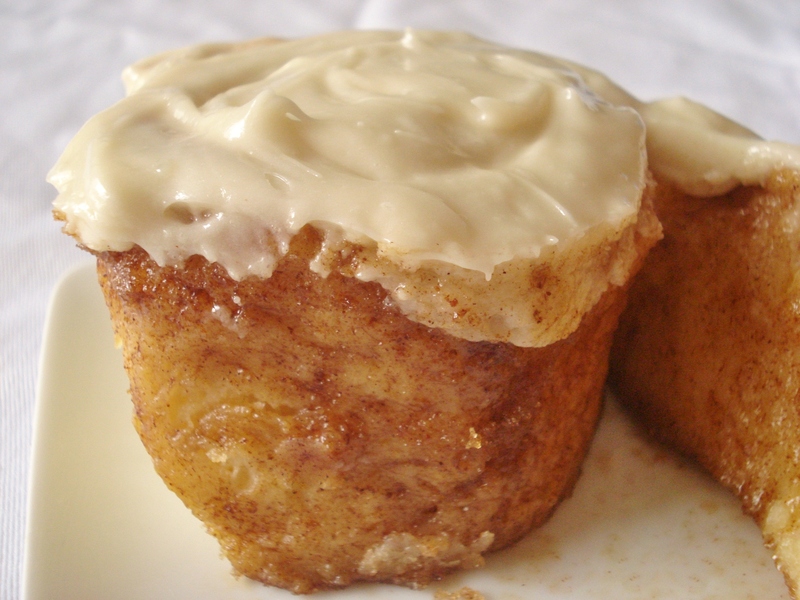 While cinnamon rolls bake, whisk cream cheese, milk, vanilla, and confectioners’ sugar in a medium bowl until smooth. Once the cinnamon rolls have finished baking, transfer the pan to a wire cooling rack and ice the rolls with ½ cup of the glaze, reserving the remaining glaze for later. Allow the cinnamon rolls to cool for about 30 minutes. Using the foil overhang created earlier, gently lift the rolls from the pan and top with the remaining glaze. Serve warm.